This weekend was quite a fine one for meeting old friends and acquaintances and meeting other friends I know through online media in person at last. 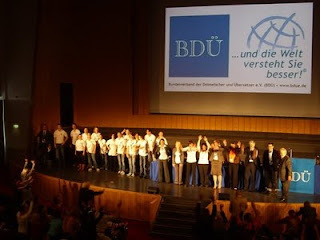 The BDÜ conference Übersetzen in die Zukunft - Herausforderungen der Globalisierung für Dolmetscher und Übersetzer drew over 1600 attendees for three days of presentations, exhibits and events. As my friend Aniello Scognamiglio related last night while we enjoyed a quiet meal at Wittenberger Platz, the conference was a huge success. Hearing this from someone who is sometimes skeptical of the BDÜ and having heard this from equally discerning colleagues Friday night at the ProZ PowWow at the restaurant Luise near the FU Berlin I can only conclude that it was something very special, which I hope will be repeated in the future. I had planned to attend myself, but the hunting course I started in August conflicted with two of the scheduled conference days, so that was not possible.Too bad, because as the event was described to me, it sounds like the BDÜ got everything right. The ProZ gathering Friday evening was smaller than the rather large get-together that Steffen Walter has organized for years, but it was still well-attended to the point where in a long evening I didn't have time to talk to half the people I wanted to. Say what you like about the crappy job posts from bottomfeeding Chinese and UK agencies on ProZ, the juvenile behavior of many unqualified moderators and the often almost abusive lack of transparency in many matters, the powwows organized by members are inevitably worthwhile. I always meet interesting, competent colleagues and learn something from our exchanges. This time around I had the pleasure of a long chat with Oleg Rudavin, author of an excellent book on Internet freelancing for translators (which I'll be doing a full review of for the BDÜ sometime in the next few months). He was at the conference to promote his book and represent ProZ, and our conversation made it clear to me that the insights in his book are drawn from a deep well of varied and interesting experience from which there is much more to be had. He is considering German and French versions of the book adapted to the respective markets, and I do hope these plans are realized, because they will - at least for German - fill a significant information gap for translators without strong English skills. I also learned about a good possibility for online business mnagement for freelancers (more on this later maybe after I check out the details), and my dog Ajax and I very much enjoyed the company of agency owner Caroline Montexier from CMLT in Cologne who updated me on the market situation for agencies while Ajax tried to climb in her lap and eat her ponytail. Ralf Lemster had a cool new Australian hat which reminded me hat I need something better to keep the rain out of my eyes while I sit up late at night waiting for the wild boar to show their ugly snouts. I can recommend these gatherings even to dyed-in-the-wool ProZ-haters, because they really are fun, and I always find the opportunity to talk face-to-face with others in my chosen profession worthwhile. Other than that it's been a quiet weekend at home with my German Wire-haired Pointer Ajax, translating and making applesauce from all the myriad apples falling from the trees in the garden. The other two dogs (wire-haired Magyar Vizslas) have been off in the Netherlands adding to the increasingly crowded trophy shelf in my partner's office and giving me the peace and quiet I need to perfect Ajax's retrieve. Thanks for the interesting report Kevin. Unfortunately haven't heard a peep out of Aniello at proz.com for quite some time - hope he didn't give up tilting at windmills there. @Michele: I think he's been extremely busy of late. And I think - like many ProZians - he is a little disappointed by the directions taken in moderation, monetizing the site and other matters. As a German and an IT expert, he takes the recent issues of data security and privacy very seriously, and with so many comments being squashed by moderatorZ and staff on ProZ he might not see the point of carrying on much discussion there. In general the forums appear to be much quieter now than they were a year ago, because many have simply given up on them.